The Fairfield Lions varsity baseball team poses for a team photo on Tuesday. Pictured front row (l-r): Lane Sparks, Logan Rohde, Jacob Morgan, Ryan Ludwick, Nathan Vidourek, Wyatt Willey, Zane Acton, Orrie Friend, Hunter Burns and Head Coach Jeremy McGraw. Back row (l-r): Assistant Coach Jason Fox, Layne Morgan, Sam Buddelmeyer, Griffin Irvin, Andrew Dingey, Ethan Grooms and Austin Setty. 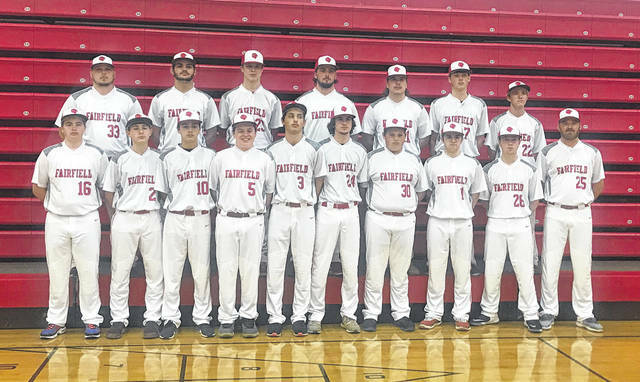 The Fairfield Lions finished the 2018 season in third place in the overall Southern Hills Athletic Conference standings with a 10-3 record and were second in Division II of the SHAC behind the Whiteoak Wildcats. The Lions will feature seven returning starters from the team that finished with a 12-7 overall record and only lost two starters from last season. Sam Buddelmeyer is one of six seniors returning for Fairfield and will be relied upon to consistently bring his best stuff in all phases of the game especially on the mound and at the plate for the Lions. Austin Setty is another senior returner that will be expected to play at a high level for the Lions in 2019 and will likely set the tone at the plate as the lead off batter for Fairfield. Griffin Irvin played primarily in the infield in 2018 and will likely take on the role of full time first baseman for the Lions and will also bring the same power to the lineup that he displayed for Fairfield last season. Andrew Dingey , Layne Morgan and Ethan Grooms round out the talented senior core that along with junior Wyatt Willey will also be expected to perform well for the Lions this season. Along with the returning players the Lions also have several younger players that the Fairfield head coach said are competing with their older counterparts already. “We have several younger players that are competing and I feel are going to make an impact,” McGraw said. The Lions struggled with moving on after making a mistake a year ago according to McGraw, but the team has made strides in that direction in the off season and he expects the year of experience for his team to make a difference for the Lions in 2019. The Lions start their season on the road when they travel to East Clinton on Monday, March 25, to take on the Astros in a non-league game. The first of the Lions’ five cross county rivalry games will occur Thursday, March 28, when the Lynchburg-Clay Mustangs visit Fairfield. The McClain Tigers will welcome Fairfield to Mitchells Park in Greenfield on Saturday, April 6, for the second and third cross county rivalry games on the schedule for the Lions. The Lions will wrap up their cross county games with consecutive Tuesday games on April 23 and 30 against the Whiteoak Wildcats who finished 13-0 in the SHAC in 2018. The Lions are scheduled to end their season with a home game against the Huntington Huntsmen on Thursday, May 9.